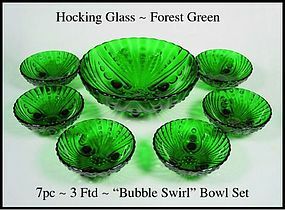 This 7pc Hocking Forest Green bowl set is very nice. 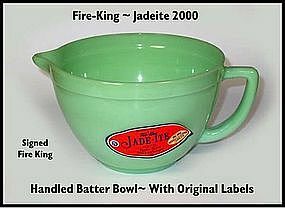 There is a tiny factory flaw in the pattern on the large bowl, but is hardly noticeable. 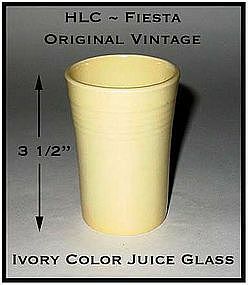 The 6 small 4 1/2" bowls look unused, as does the larger bowl except for the flaw. 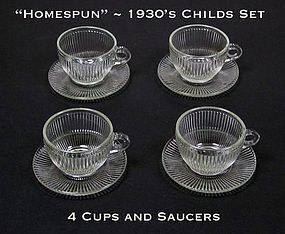 You would be pleased with this set. 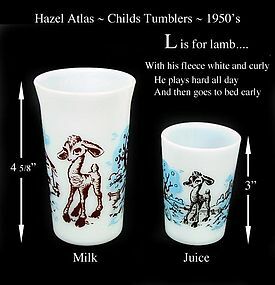 This child's alphabet mug is unusual in the fact that it has advertising on it for Bond Hill Dairy. 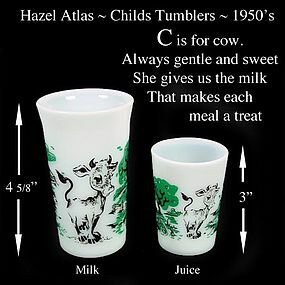 It was made by The Hazel Atlas Glass Co. in the 1950's, and in excellent condition. 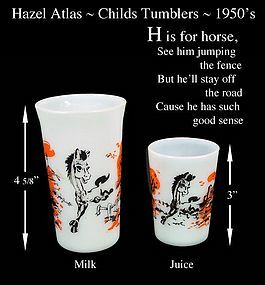 It is marked HA on the bottom. 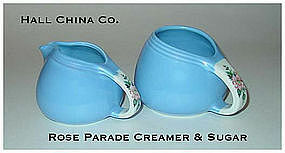 This Rose Parade blue creamer and sugar set was made by The Hall China Co. in the 1950's and is in excellent condition. 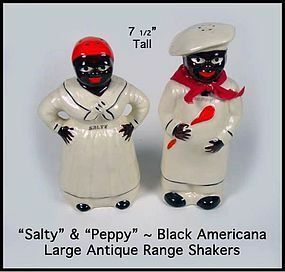 Both pieces are signed on the bottom. 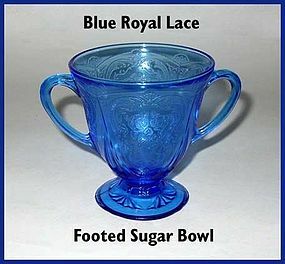 This blue Royal LAce sugar bowl was made by the Hazel Atlas Glass Co. in the 1930's and is in excellent condition. 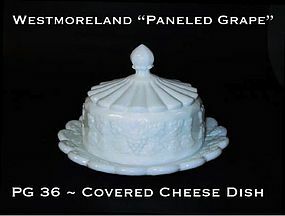 This blue Caprice 10 1/4" oval tray was made by Cambridge and was used for celery or carrot stcks. 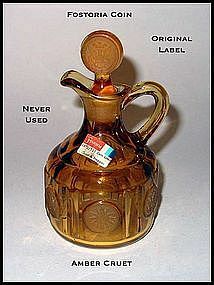 It is in great condition! 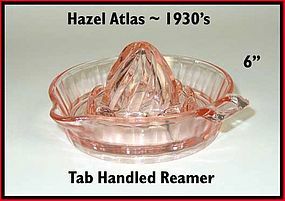 This tab handled pink reamer was made by Hazel Atlas in the late 1930's. No chips, or scratches. Small black ash mark in the bottom. 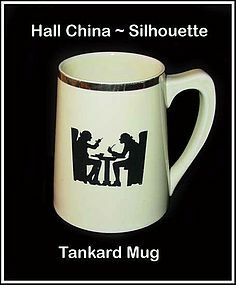 Hall China Taverne Silhouette Unusual Tankard Mug~Nice! 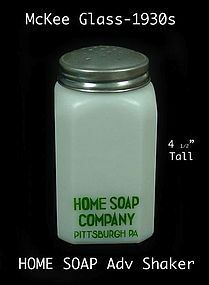 This tankard style mug was made by The Hall China Co. and it has the Taverne, or Silhouette pattern on it with platinum trim. 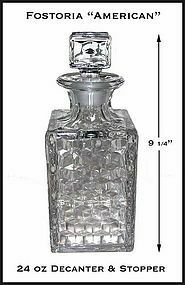 It is in excellent condition and signed with the HSQK mark on the bottom.